Today was a quiet day after we ran some errands. After stopping at a few other stores, I popped into the LYS while DH did the grocery shopping. 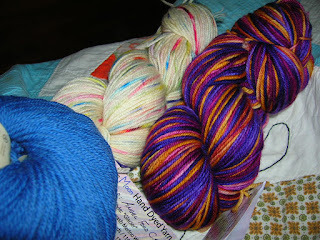 I'd forgotten they were having a huge trunk show from Cider Moon and I indulged in a few skeins of their lovely yarns. Yum! 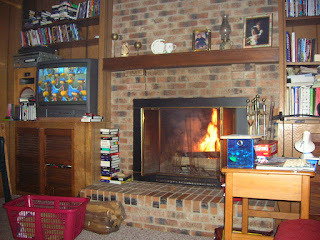 After we were home for a while, watching TV, reading (DH) and knitting (moi), we lit a fire in the fireplace - isn't that lovely? 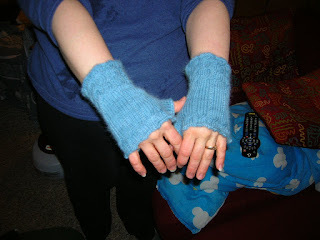 And finally - I've been wanting to knit up some of these fingerless gloves since I saw the pattern on Knitty.com . I cast these on in Classic Elite's Lush yarn this morning, and lo and behold they're blocking now! This pictures doesn't do them justice, but the knitty site does. There is lovely cable detailing on the cuffs and by the knuckles. I love them!